For all of you that have always dreamed of going on an epic safari and never felt like it was a tangible dream, South Dakota awaits you. 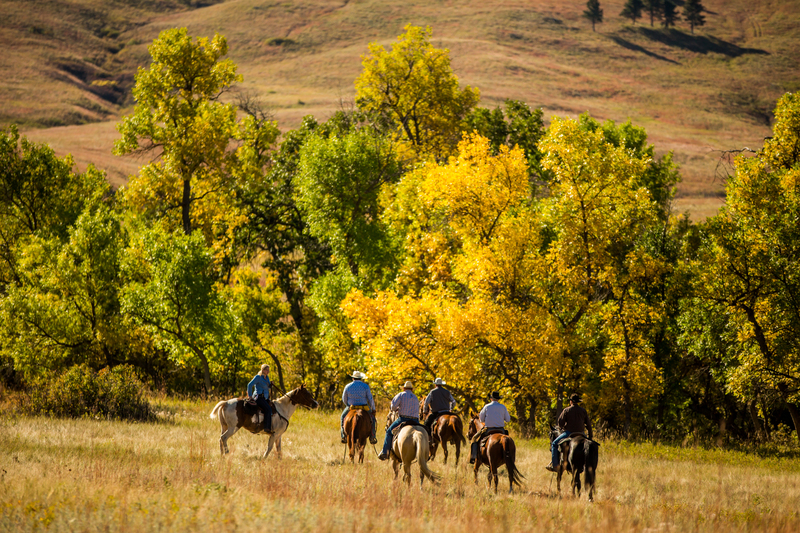 You don't need your passport, to learn another language, or to even know how to ride a horse. 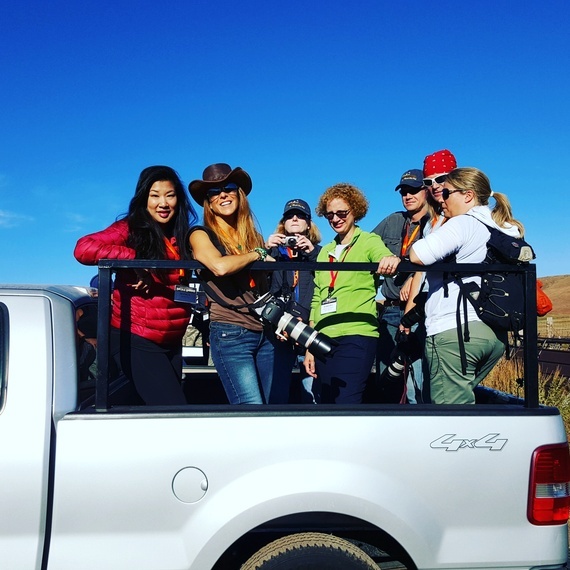 When you think of going on safari, you instantly think of East Africa, the Serengeti, the Big Five, and long open plains with the last of this planet's great beasts still roaming free. It is usually on most people's honeymoon wish list or on the top of their bucket list, but to most people it is too far, too exotic, and too expensive to do. 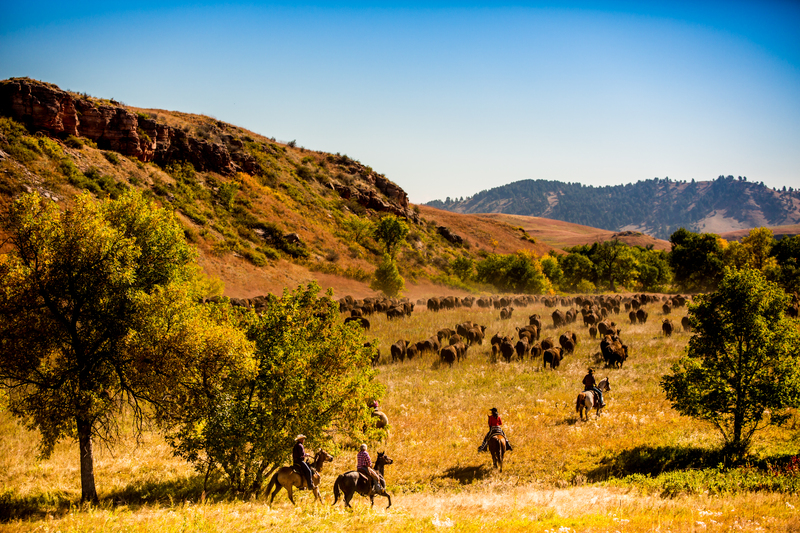 When people travel to watch the great migration of nearly two million wildebeest across the plains of Tanzania's Serengeti, they are witnessing one of the oldest and last great land migrations on Earth. That is just a glimpse of what our planet used to look like before humans took over their lands and hunted them down. But what if I told you that you don't have to go to the other side of the world to Africa to witness great beasts of our past roaming free? 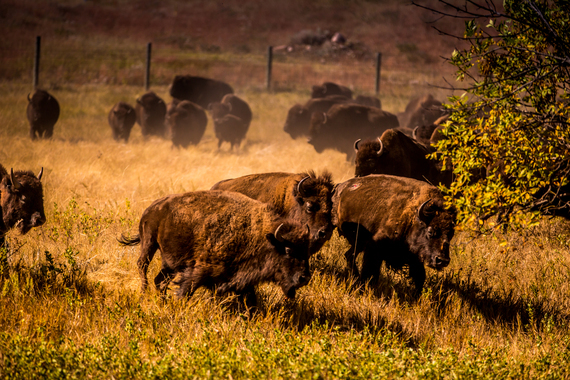 What if I told you that there is a migration of animals that is just as cool as the wildebeests in Africa, but right in our own backyard in the United States? I didn't believe it at first either, but that was just one of the many surprises South Dakota had in store for me when I went there. The American buffalo once roamed the grasslands of North America in the tens of millions. 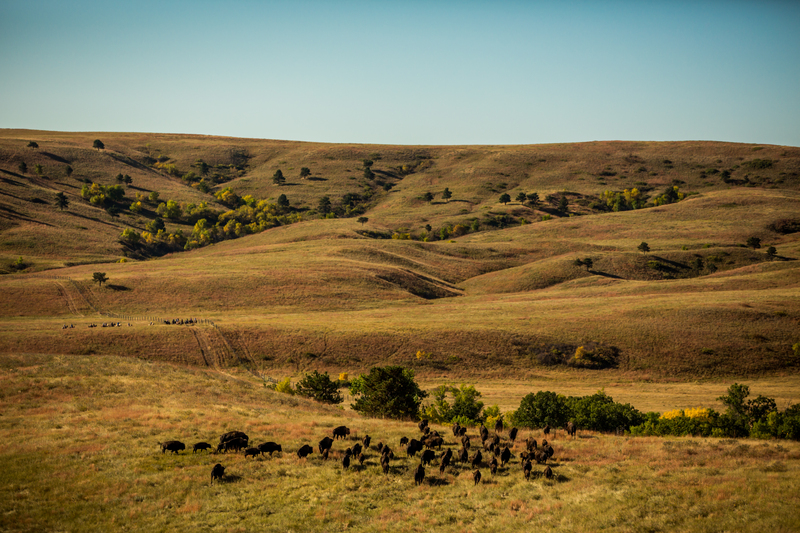 These massive herds were almost completely wiped out by a combination of commercial hunting and slaughter in the 19th century but because of the efforts of government protected lands such as Custer State Park, they are making a come back and have been brought back from near extinction. 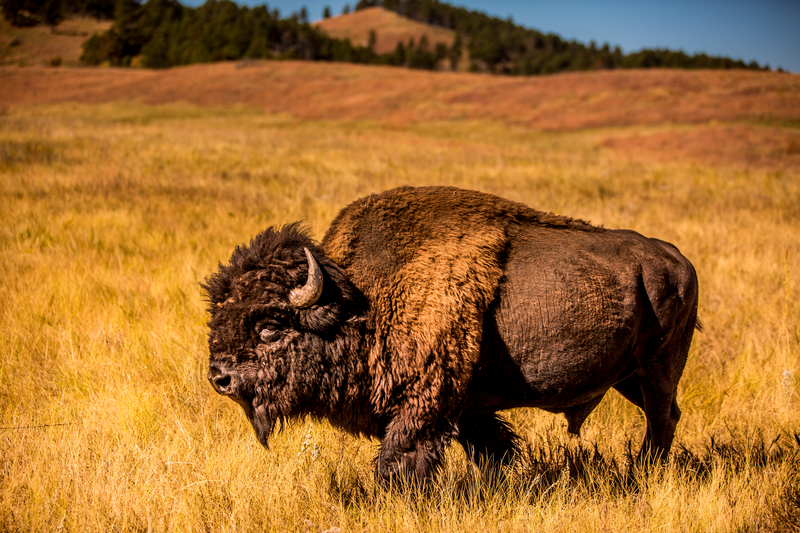 These giant animals are more powerful, fast, and graceful than you would think and can jump nearly 6 feet vertically, outrun a horse, and turn on a dime. All reasons that make the annual Buffalo Roundup one of the most popular and entertaining events that you will ever witness. 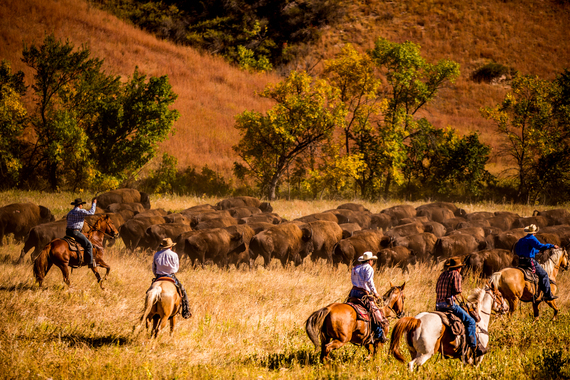 It is an incredible sight to see real cowboys and cowgirls roundup huge herds of buffalo across rivers and through prairies in front of thousands of spectators. 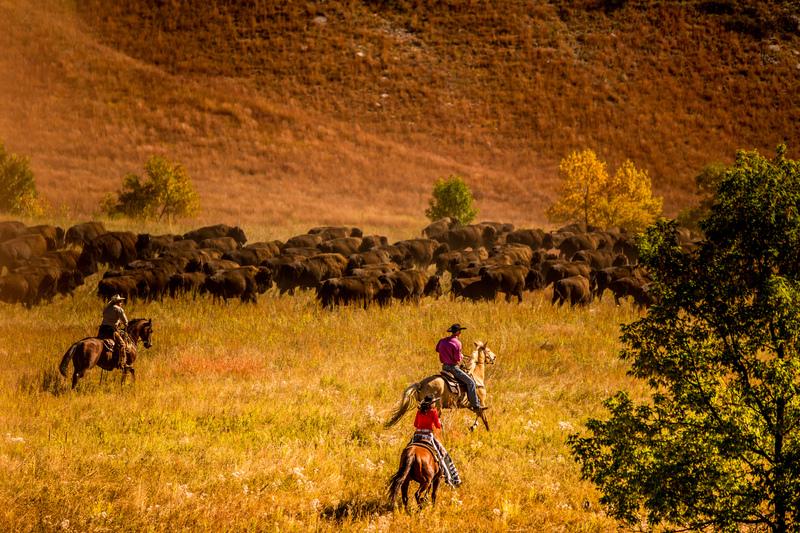 It was one of the most magical experiences I have had to watch these huge animals running across the plains and imagining what our country must have looked like 300 years ago when the first settlers came over and these great herds roamed the plains. The only way I could describe it was like being on an All-American Safari. 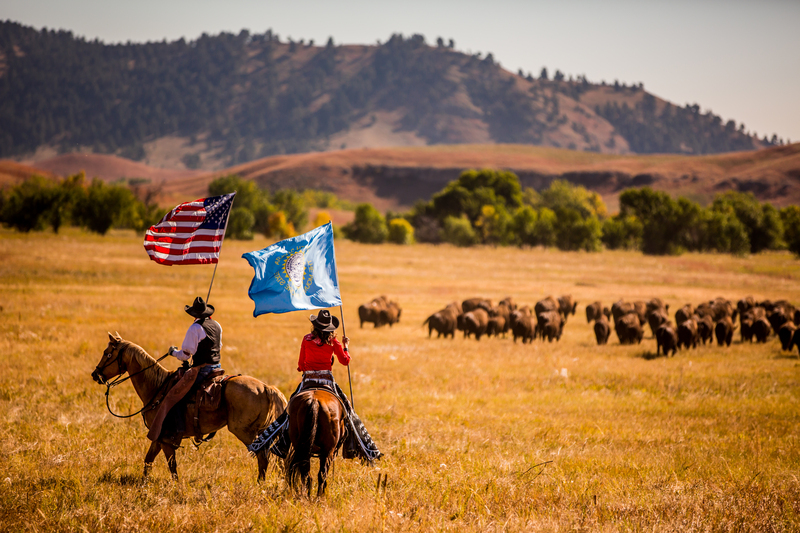 This year marked the 50th anniversary of the Annual Buffalo Round up at Custer's State Park in South Dakota. 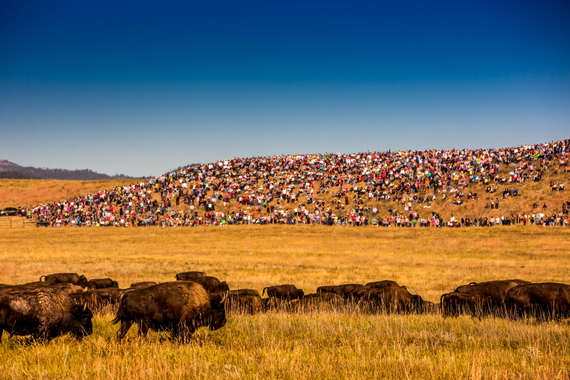 Originally, this event was just to keep the bison population in check with the available grassland by culling the herds, keeping track of them, and bringing them in to the protected national park where they would get vaccinated and some auctioned off. 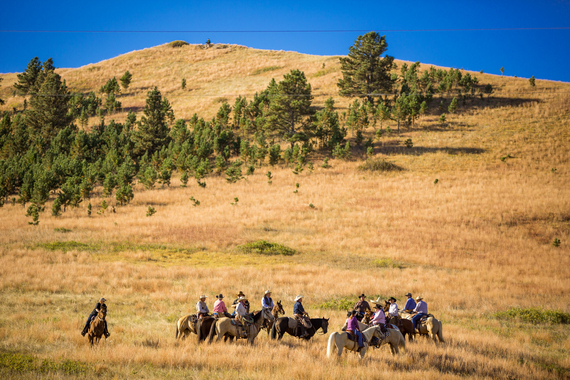 The revenues from the auction help to support the operations of the state park system. 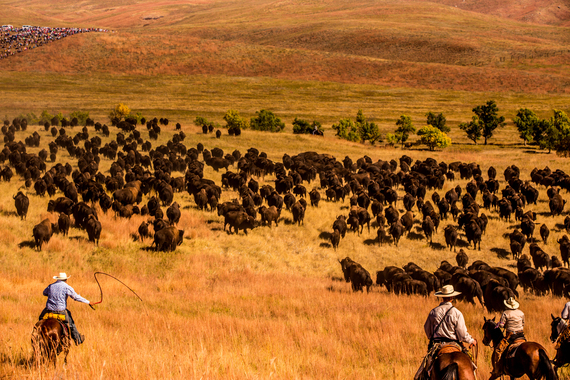 Buyers from all of the United States and Canada have purchased the Buffalo from the park and now have started herds of their own. 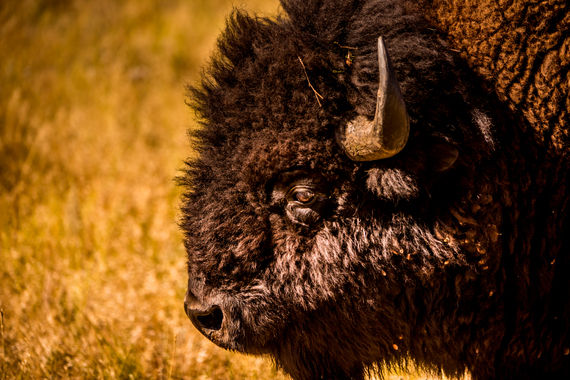 The American Buffalo which once faced extinction are now up to 500,000 in Northern America. 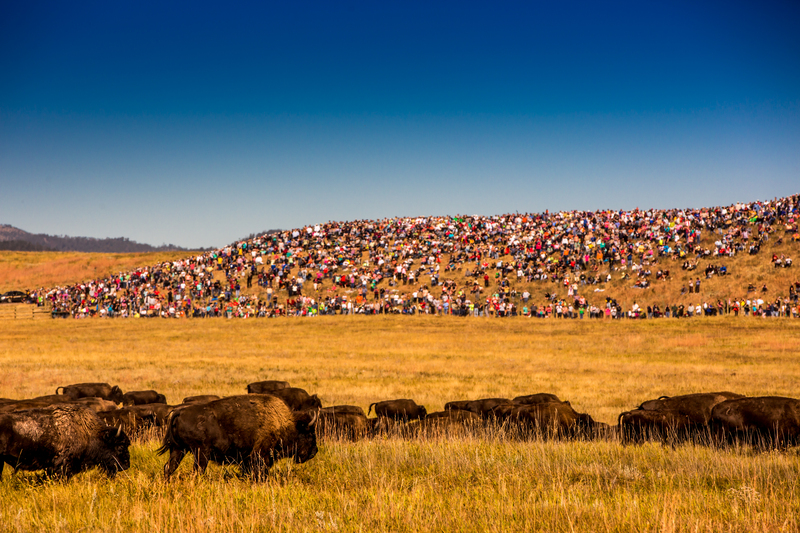 In recent years, the annual Buffalo round up has become such a huge attraction for South Dakota, that the Board of Tourism has now taken notice. 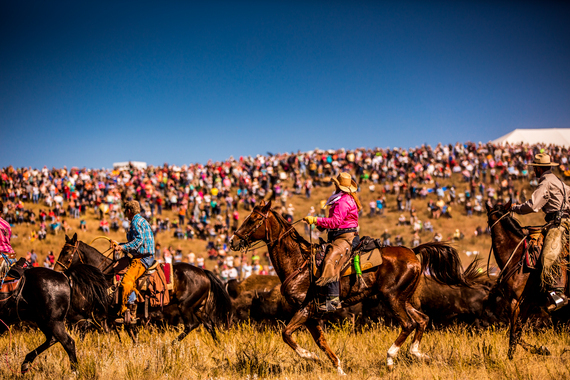 What used to be a one day event, has evolved into a 3-day arts festival with continuous entertainment such as Native American Dancing, Cowboy poetry, clog dancing, trick shooters, a chili cook off, a bison burger barbecue, and of course the main event where 25,000 people line the foothills of the park to witness the chosen cowboys and cowgirls that had the honor to ride out and round up the herds into the national park. 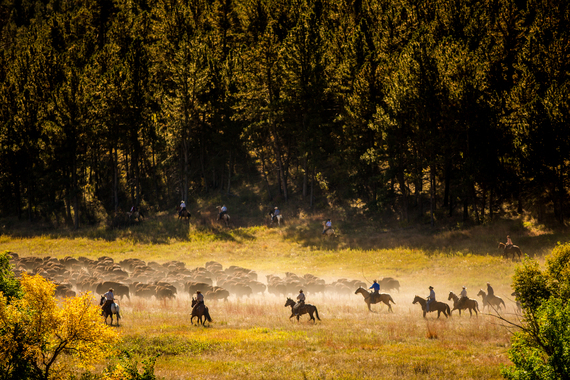 The morning of the roundup felt like I was on safari. 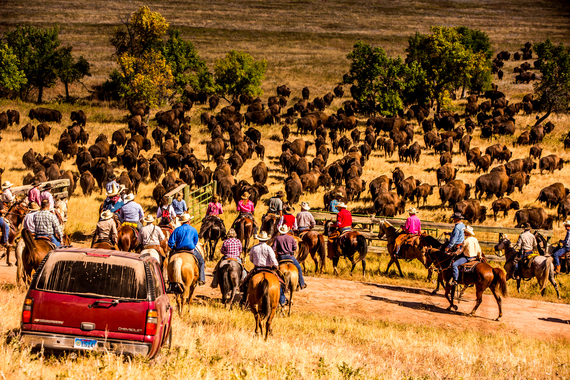 We got up at dawn, chugged some coffee, and piled into trucks to try to find the herds. I was part of a group of photojournalists that came to document this migration of Buffalo and although we all felt like we channeled our inner cowboys, there was no way that we were going to be galloping on horses across plains pock-marked with prairie dog holes, chasing after animals that can weigh up to a ton and outnumber and outrun you. Even some of the most experienced cowboys were taken away on stretchers in front of our very eyes. 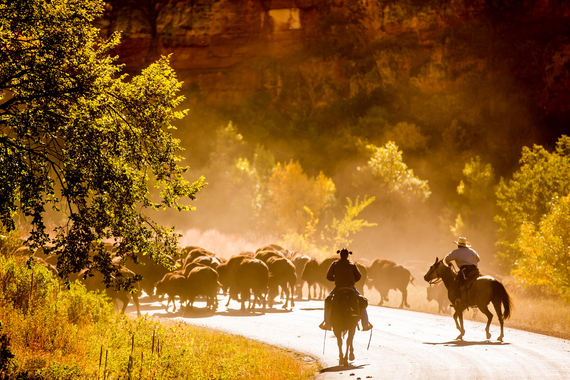 Being a cowboy is no joke. Although we were not on horseback, we got to experience the next best thing, which was standing in the back of pick-up trucks, holding on for dear life, and off-roading across the plains behind the cowboys with our cameras. We even ended up helping the cowboys on radios to round up the herds at the end when the Buffalo decided they wanted to be rebellious and sprint in the opposite direction towards the cowboys instead of away from them. 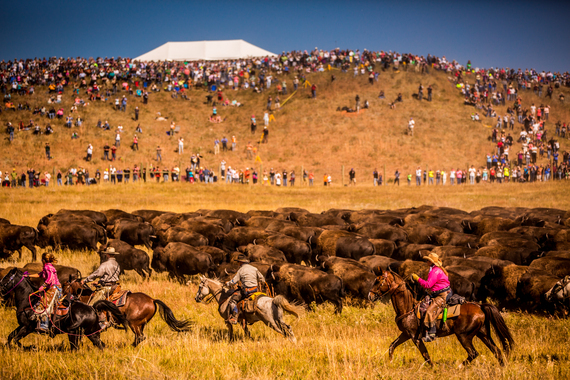 The chase that ensued was utter chaos for about half an hour trying to herd them up again two or three times, before the crowd roared and we successfully got them into the corrals. Apparently, they were putting on a great show for the 50th anniversary and the roundup did not disappoint its fans! 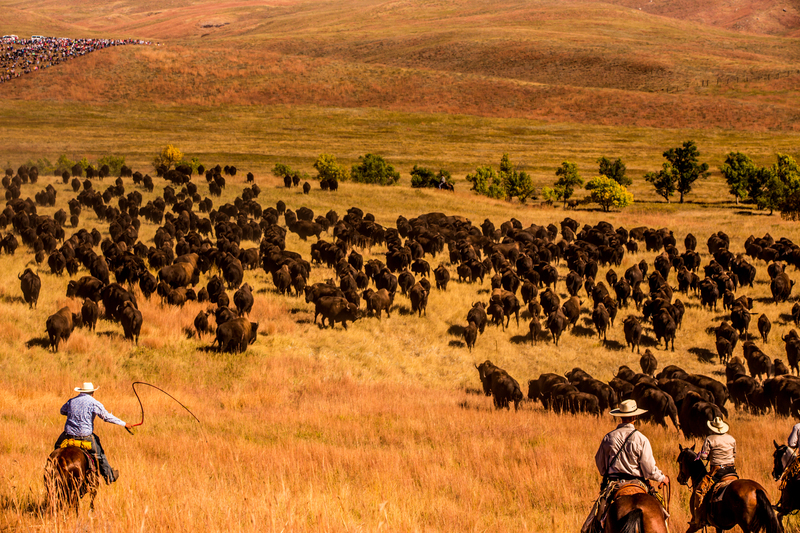 After the roundup, over a picnic lunch of bison burgers and baked beans, I started drawing comparisons between visiting South Dakota and seeing the last herds of Buffalo with going to Africa on safari. 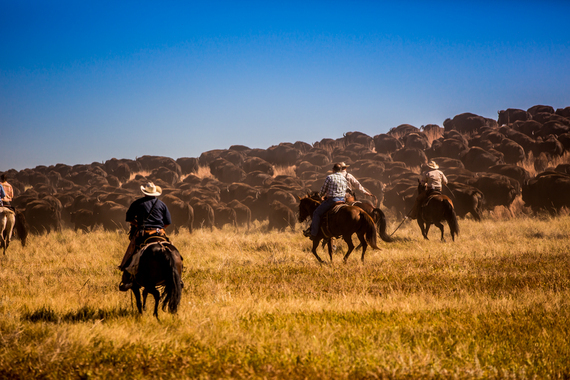 Any type of journey or expedition to find wild animals is considered a safari, but what was special about the Buffalo Roundup was that it had that magical, exotic, nostalgic quality of going to a remote continent like Africa and seeing these rare and majestic animals, yet you have never left the United States. You truly felt like you were back in time and experiencing what it would have been like hundreds of years ago in the Wild West. It was a surreal, once-in-a-lifetime experience and I kept trying to soak it all in throughout the day while I was there and found myself starting sentences off with, "When I was rounding up Buffalo this morning..." which just sounds ridiculous, yet there I was. 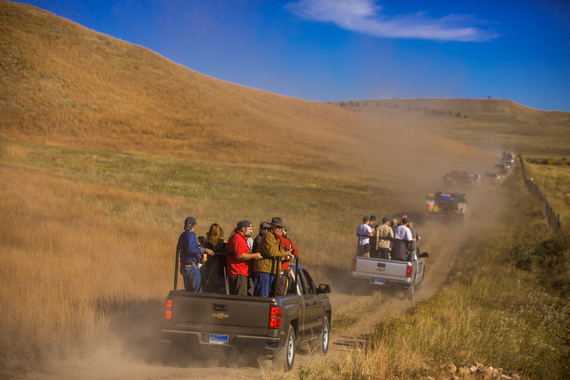 So, for all of you that have always dreamed of going on an epic safari and never felt like it was a tangible dream, South Dakota awaits you. You don't need your passport, to learn another language, or to even know how to ride a horse. 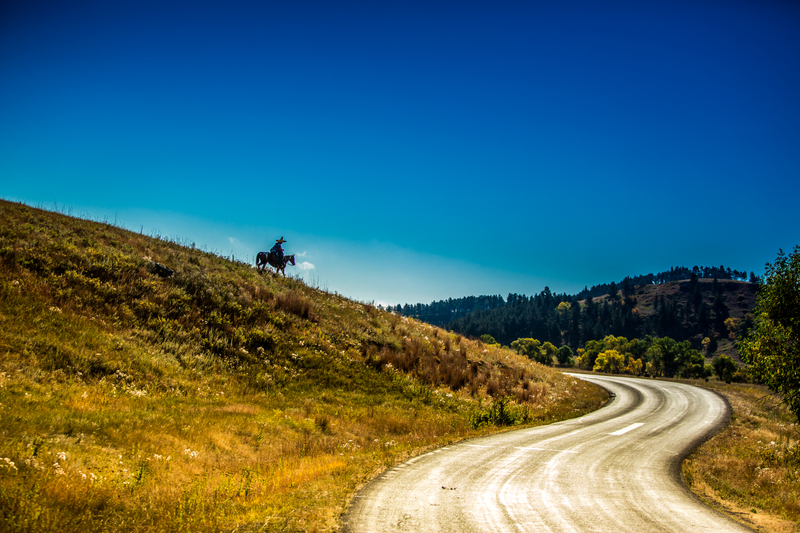 Just bring a cowboy hat, some boots, and a willingness for adventure, and the rest you will discover when you get there.